I see winemaking as an art. I also want to put a smile on people’s faces with my wine and I’d like to imitate the master winemakers that I’ve met on my travels. They are my goals. So I was particularly interested in a copy of the Mona Lisa that I’d seen in Food & Wine. It had been painted in wine. 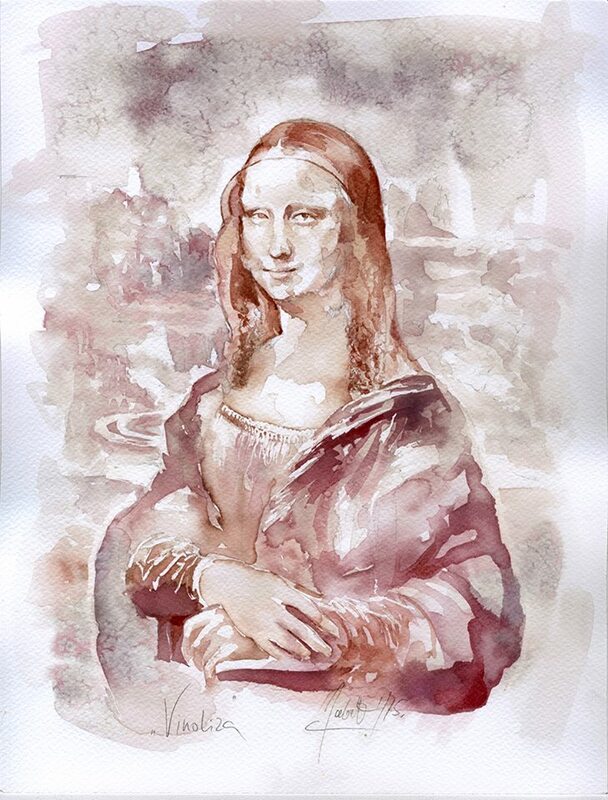 The young artist who created the image, Sanja Jankovic, brilliantly captures Mona Lisa’s famous smile. Not an easy thing to do under any circumstances let alone using “controlled wine stains”. As I was thinking about the design for my wine label at the time, I delved a little bit deeper into her work. On the Behance website there are some amazing images of the cast of Game of Thrones, including Lena Headey (Cersei Lannister), Rory McCann (Sandor Clegane) and Peter Dinklage (Tyrion Lannister). There are also reproductions of famous paintings by Michelangelo Merisi da Caravaggio, Gustav Klimt and Frans Snyders, portraits of celebrities such as Marilyn Monroe and family portraits. The work is stunning. The collection is impressive as a portfolio, even more so when you consider Sanja is working with a limited range of colours. It’s mostly shades of blue, purple and brown from layers of Merlot and Cabernet Sauvignon. Sometimes, when Sanja is feeling flush, Pinot Noir is used. Rosés are used to add warmth while white wines — typically Riesling, Chardonnay and Sauvignon Blanc — are used as solvents or to add shades of green, yellow and gold. I was so impressed with the young Serbian artist that I commissioned her to design the logo for this website, ywine.press, its forthcoming wine club, ywine.club, and the labels for my wine. As time was tight and the budget even tighter, we agreed to use some of her existing artwork as the focal point of the design. 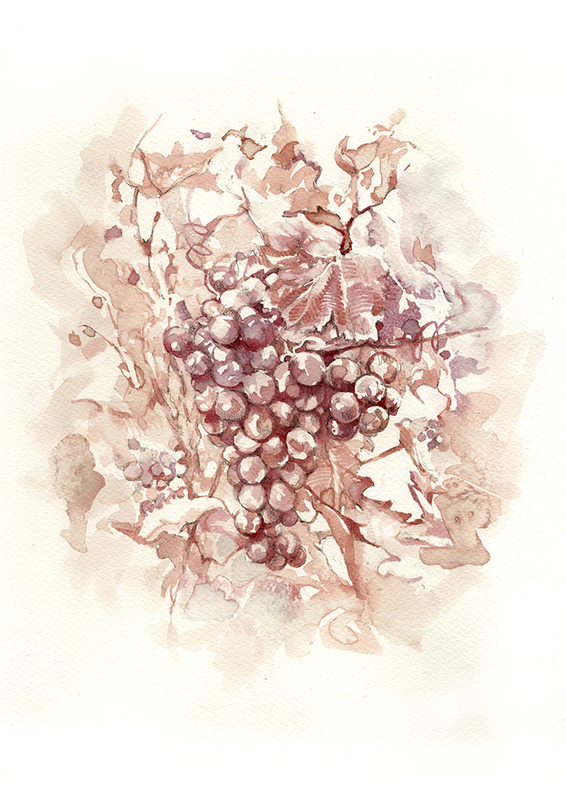 My favourite is the painting of grapes from a friend’s garden (shown above). But she also designed the labels with her ‘Wine Lisa’ and Snyders fruit basket still life (also above) to gauge the public’s taste. We have put the images on our Facebook, Sanja's Facebook and my Twitter pages to see which design our friends and families like best. A little embarrassed, she told me she walked out of the tasting with some of the half-finished wine samples in her hands. “Everybody gave me a very awkward glance on my way out. From their side, it must have looked very odd, but from mine, a new idea had emerged and had to be realised as soon as possible. Winerelle is her term for 'wine painting' and has become the name of her wine painting project, which can be viewed here. Since starting this project, Sanja has been commissioned to produce a series of wine paintings and a mosaic of used corks for a group of wine bars and shops in Serbia. Sanja’s ultimate dream is to travel the world painting wineries, vineyards and winemakers using their own wines. 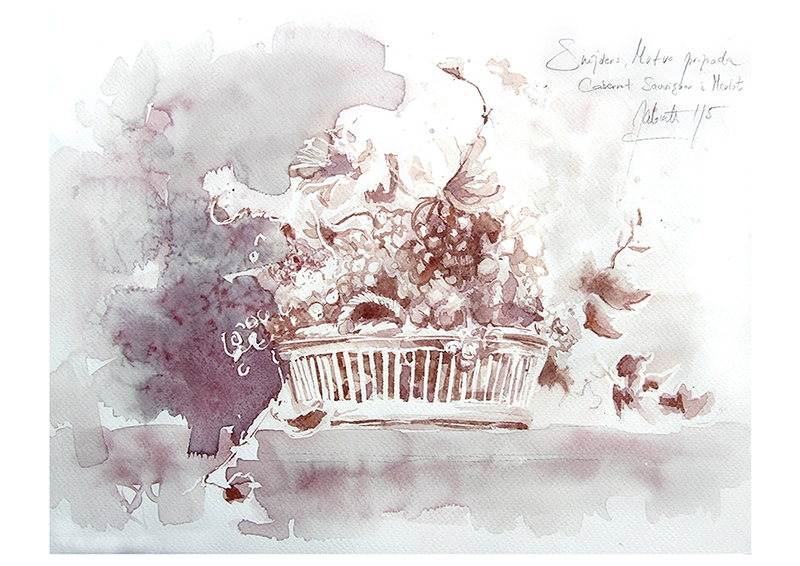 To commission a painting from Sanja contact her via Facebook or Behance. Is this the most interesting wedding wine list ever? Don’t tell the bride but her wine-loving father has hijacked her theme to promote some obscure grape varieties. Wine writer and part-time winemaker Chris Boiling aims to use his daughter’s wedding to raise the profile of Laški Rizling, Juhfark, Blaufränkisch, Kadarka, Furmint, Plavac Mali, and Rară Neagră. “These are some of the world’s finest and least-known grape varieties,” Chris said, as he unpacked the latest delivery of wedding wine – 24 bottles of Juhfark from a variety of producers in Somló, Hungary. A selection of Juhfarks - THE wedding wine! The wedding will take place in an old fort in Cornwall. The welcome drink: Zlati Grič Konjiška Penina 2015 – a sparkling rosé made from young Blaufränkisch vines. “Young, fresh and sparkling – like the newlyweds,” is how Chris describes it. Whites for the main course: Two of the world’s best Laški Rizlings from great years – Villa Tolnay Welschriesling 2008 (the year the bride and groom met at Plymouth University) and Marof Laški Rizling 2012; plus a selection of Juhfarks (a different producer, style and vintage for each table to encourage some mingling). Reds for the main course: Schieber Szekszárdi Obsitos Bikavér 2013 from Hungary (showing how Bull’s Blood has become more sophisticated); Equinox 5 Elemente 2013 from Moldova (another excellent red blend; this one features 25% Rară Neagră). Slovenian and English fizz because Prosecco and Champagne are so 2015!